30 Days of Deadline for Dubai Residence has been given by Dubai Health Authority. By June 30 2016, every Resident with Dubai Visa must sign up for mandatory health insurance. After press Release on Monday 30th May 2016, The Authority Director of Health Insurance Dr. HAIDER AL YOUSUF advised residents to apply for medical insurance before the deadline. Nine Attested Insurance Companies by DHA are offering EHB Package (Essential Health Benefits) to Dubai Residents. Cost of EHB Insurance Package? As per Dr. HAIDER AL YOUSUF EHB is a community Package which starts at a minimum of 565 AED, maximum of 650 AED per year. Dubai Health Authority said that many blue collar expats and spouses of Dubai currently do not have any health insurance. Workers from Asian Countries like Pakistan, India, Bangladesh, Sri Lanka, Nepal etc can get the benefit of Insurance Package in their home country too. The expats will be able to get satisfactory health cover in their home countries using the same insurance card with the same charges that cost maximum of 650 AED per year. What include in health cover Package? The basic cover includes outpatient consultancy at clinics, maternity health cover , referrals to specialist and for surgical and pathology investigations, emergency visit to hospital and any surgeries required. While employers have group insurance schemes for their employees, a resident can shop for a tailor-made cover for his dependents that includes spouse, minors and domestic house help. Maximum coverage and how much a worker expected to pay? The Expats (beneficiary) with basic insurance cover gets a maximum coverage of up to 150,000 AED and has to pay 20% (per cent) at every visit to the doctor. So, if someone has outpatient bill of 200 AED he/she will have to pay 40 AED only, or if someone has major surgery amounting to 40,000 AED he/she would be expected to pay 8,000 AED. New born babies are covered under mother health insurance package for first 30 days , parents have to apply for child individual insurance package within 30 days period. Insurance package will only cover general health requirements such as Cough, cold, flue etc. Special services like cleft palate, down syndrome and club foot, speech therapy or physiotherapy etc are not included in this package. The expats earning less than 4000 AED are including in this EHB Health Insurance package. If any one fails to do Medical Insurance, his/her sponsor (Company) will be fined for every month beginning from July until the time his visa comes up for renewal. If the individual is on his own visa, a freelancer or self-employed, he/she will have to pay the fines himself. 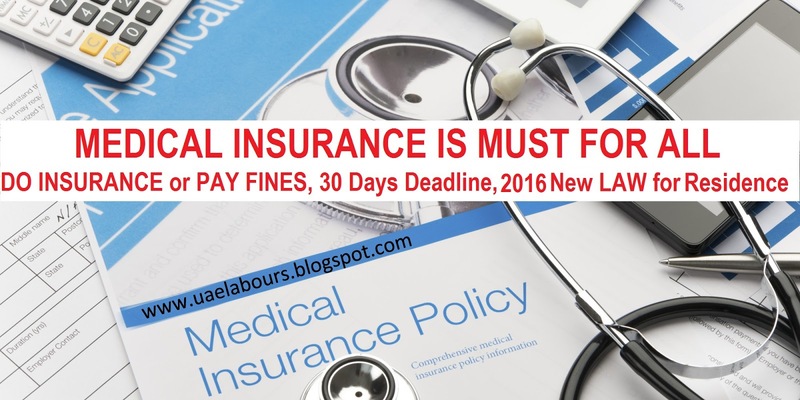 There are monthly fines which will be charged with retrospective effect from 30th June 2016. The amount of Minimum fine is 500 AED per month, so the failure to obtain insurance could result in fine 500 AED every month. Our services includes measurement, manufacture & installation of blinds in Dubai. We provide Roman, Venetian, shutters,roller, vertical and panel blinds. nice and very informative blog . keep it up.